Public safety officials chose a nightmarish scenario for a massive police training drill on the UCLA campus: two shooters loose in a dorm, dozens of students shot and injured, and hostages taken. The scene played out on Tuesday morning in the residence hall area, with several agencies participating. 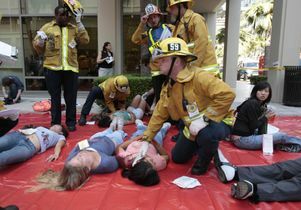 UCLA Emergency Medical Services and Los Angeles Fire Department paramedics triaged the wounded and transported them to the Ronald Reagan UCLA Medical Center. UCPD and LAPD officers controlled the scene. SWAT teams from the LAPD and FBI stormed Rieber Residence Hall, where the "incident" took place. Life continued normally outside the drill zone, with students and cheerleaders from a summer camp walking nonchalantly past views of controlled chaos. Tennis stars at the Countrywide Tennis Classic played calmly despite booming "flash-bang" bombs used by the SWAT teams. The training exercise was designed to test the agencies and their ability to work together when faced by large-scale violence on a college campus, much like the deadly Virginia Tech campus shootings in April 2007, officials said. At a mid-day news conference, representatives from the agencies involved said they were pleased with the response they had seen so far. "This is hopefully an exercise that will never have to take place in real life," said Los Angeles Mayor Antonio Villaraigosa. "But if it does, we'll know that we've done the best we can to simulate a disaster of this kind to prepare for it."